A few months ago, we included a review of a book edited by Richard D. Phillips, God, Adam, and You. You can find Dr. Van Raalte’s review here. I’ve had the book for a while, but have only just begun reading it myself. So far, it definitely lives to up to what was said in the review. It is not necessary for us to go in this direction. Why couldn’t the ancient Hebrews have understood it if God had told them that he created by a long, slow process of evolutionary change? Every day, as they planted and harvested crops or worked with sheep and cattle, they could see change and improvement in the various seeds they planted or the animals they bred. Why couldn’t God effectively communicate to them that he had conferred a human soul upon an existing animal rather than breathed life into a body formed directly out of the earth? Why not reveal in Genesis that God made many human beings at first, instead of just one? Why would these things have been harder for them to accept than the idea that there is only one true and living God, given that all their neighbors worshiped many gods? And why must we separate the way in which God created from the fact that he is Creator? Does it not glorify God as Lord to know that he created man, not through any natural process, but by a supernatural act of creation? Yes, the account of the historical Adam’s creation greatly honors God as Creator and Lord. Beeke is spot on. Indeed, theistic evolutionary views can only gain acceptance as believers succumb to lower views of the Bible. Such views typically over-emphasize the human element behind the authorship of Scripture and under-emphasize the divine. We should never forget the Reformed (and biblical) teaching that the primary author of Scripture is the Holy Spirit. And yes, “primary” is the right word. The Bible is not 50% human and 50% divine. It is first and foremost the Word of God. It has come to us through human involvement, but it remains entirely 100% the word of our Father in heaven. The more clearly we see that, the better equipped we are to stand fast against false teachings like theistic evolution. Today we are pleased to present a review of an important little book first published in Dutch several decades ago. 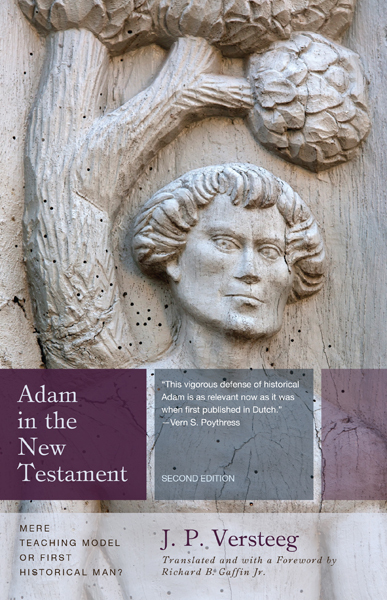 According to Dr. Vern Poythress, “This vigorous defense of historical Adam is as relevant now as it was when first published in Dutch.” We couldn’t agree more. This review by CanRC pastor Rev. Peter Holtvlüwer (Spring Creek CanRC, ON) was first published in Clarion and is republished here with permission. Adam in the New Testament: Mere Teaching Model or First Historical Man? by J.P. Versteeg. Translated by Richard B. Gaffin Jr. (Phillipsburg, NJ: P & R Publishing, 2012). First edition 1978. Apprx. $12 from your local Christian book seller. This is a great book for evangelical and especially Reformed scientists, scholars, teachers and ministers – let me tell you why. Under the pressure of scientific discovery and evolutionary theory, more Reformed scholars and scientists are feeling the academic heat to drop the long-held Christian conviction that the human race began with one man, Adam, as Genesis 1-3 relates. Websites like Biologos (whose authors describe themselves as “evangelical Christians”) openly accept evolution of humans from earlier life forms and consequently think that, at best, Adam and Eve were one pair of humans along the way. PCA ruling elder and Old Testament scholar Dr. Peter Enns is a leading figure calling for also Reformed Christians to reject the Genesis account of Adam as historical, insisting that God did not intend it to literally describe human origins. For those of us working in a secular scientific or academic environment, such a call is tempting. Why stand against much of what our colleagues believe to be true if we really don’t need to? But that call is shown by this book to be the Siren calling from the rocks, leading ultimately to the sinking of our faith. This little gem of a book (it’s only 67 pages) speaks as freshly and incisively to the subject as it first did in 1978. Translator Richard B. Gaffin, OPC minister and retired professor of Westminster Theological Seminary, has helped the Reformed and evangelical communities by making this essay of Rev. J.P. Versteeg widely available once again. Rev. Versteeg served as New Testament Professor at the Theological University of the Christelijke Gereformeerde Kerken in Nederland (in Apeldoorn) (sister churches to the Free Reformed Churches of North America). In it he demonstrates that at stake in Adam’s historicity is nothing less than the gospel itself. The beauty of this book is that Versteeg moves the controversy concerning the historicity of Adam away from the immediate context of Genesis 1-3 and looks at it from the perspective of the New Testament. This has the advantage of getting away from the scientific controversies surrounding the origins of the world and of mankind and concentrating instead on what Christ and the Apostles believed and taught about Adam. Since the Bible is its own best interpreter, this approach is surely worthwhile and can be a corrective should current scientific theory press a person to take a wrong turn in Genesis 1-3. Versteeg’s essay was, naturally, written in his context – the Netherlands in the mid-1970s. But he addresses a teaching then prevalent which is resurfacing in our time on this side of the ocean, namely that Adam was used by the New Testament writers as a sort of “teaching model.” This view teaches that for Paul and the other NT authors, Adam is no more than a pedagogical example to explain some truth about Christ and Christianity. The authors did not assume or need to believe that Adam was a real man, the first man, created in the literal manner described in Genesis 1 and 2. In a careful, judicious and highly readable manner, Versteeg challenges and refutes that claim as he exegetes each passage in the NT where Adam is mentioned by name. Another valuable contribution this book makes is Gaffin’s introductory essay in which he outlines the present-day controversy. This helps a reader to get a feel for the various arguments being made today. Gaffin uses the writings of Peter Enns as an example, providing quotations and footnotes and evaluating his writings fairly but firmly. He draws out the dangerous consequences of Enns’ views. It takes courage to publicly address a former colleague (both were professors at Westminster Theological Seminary) on his erroneous teaching (which is also done publicly) but how necessary it is to preserve the church from error! We may thank the Lord for the courage and clarity which Dr. Gaffin has been given and now presents to us in his essay. This essay alone is easily worth the price of the book. Though others will benefit from this book, I would especially urge every minister, teacher, academic, scholar and scientist in Reformed or evangelical circles to read this book. It may confirm you in the ancient teaching of the church and the historic Reformed conviction concerning Adam or it may gently correct your thinking on the topic. It will certainly educate you on the finer points of exegeting what the Bible itself says about Adam. I hope it will help you withstand pressures to set aside the clear teaching of Scripture in favour of man’s scientific theory. Whatever the case, it definitely won’t leave you unaffected. Edifying and recommended! But more recently scientists, biblical scholars, and others who consider themselves evangelical or even Reformed Christians are increasingly calling into question the common descent of all human beings from Adam. Moreover they are persuaded that their doubts about this truth should be accepted as compatible with their Christian commitment (No Adam, no Gospel, 5). Every Christian truly submitted to the Bible’s authority needs to be alert to this relatively recent development. Despite what others may tell us, we need to be clear about the consequences of these doubts and denials. No matter how well intended, they undermine the gospel and will lead to its eventual loss. The truth of the gospel stands or falls with the historicity of Adam as the first human being from whom all other human beings descend (5). Who is Gaffin? He began teaching New Testament at Westminster Theological Seminary in Philadelphia in 1965 and just recently retired. He had great appreciation for developments in redemptive-historical exegesis in our Canadian Reformed tradition, and loved the work of Geerhardus Vos and John Murray. He is well-known for careful, consistent, and historically-informed biblical exegesis. In the first half of the book Gaffin makes a number of salient points about Adam in Romans 5:12–19 and First Corinthians 15:21–2, 45–9. In the second half he addresses the published views of Peter Enns, who was once a fellow faculty member with Gaffin at Westminster. Gaffin demonstrates why believers must hold together the historical reality of Adam with the theological reality of original sin, original guilt before God, salvation through Christ, and eternal glory. He deals with the approach that denies Adam’s historicity as well as that which affirms his historicity but denies that he is the first human being who fathered the whole human race. What he doesn’t consider is the position of, for instance, Tim Keller, who tries to maintain Adam’s historicity, his fatherhood of the whole human race, and his biological evolutionary ancestry. 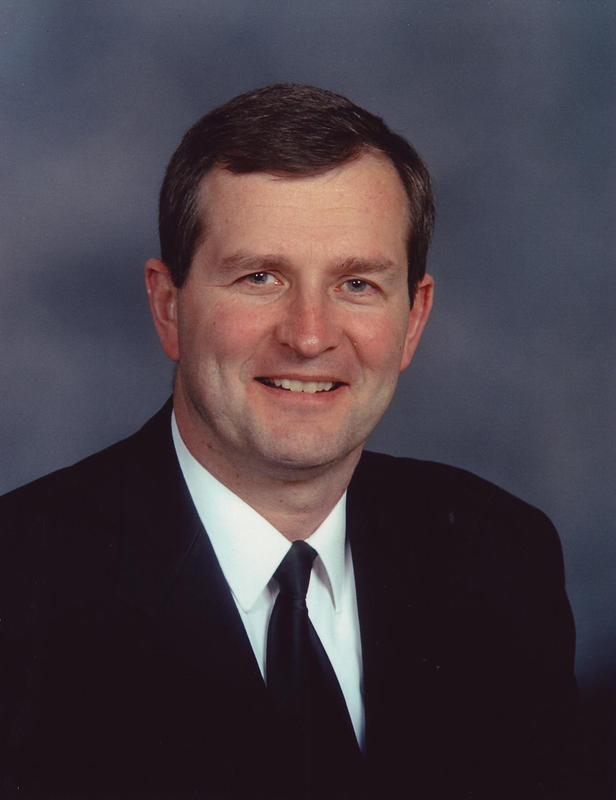 Peter Enns, whose views Gaffin particularly addresses, argues that Christians do not need to believe in a historical Adam in order to maintain the rest of Christian doctrine. Gaffin convincingly proves that this is an unbiblical position. And, in fact, when Enns argues that “a true rapprochement between evolution and Christianity requires a synthesis” (15), it appears that Enns himself realizes that most of the core doctrines of the Christian faith require major renovation if they are to accommodate the theory of evolution. Gaffin demonstrates that Enns’s views on sin, salvation, the purpose of Christ’s death and resurrection, as well as on the end times are all incompatible with the biblical message (15–26). Basically, Enns is offering up nothing but a reworking of the theories of the liberal biblical scholars of the late nineteenth and early twentieth centuries (26). Finally, not to be missed is the view of Scripture involved in Enns’s historical-critical approach, as it makes contemporary evolutionary theory decisive for interpreting Scripture and so for deciding what in it is or is not valid and relevant today (27). One could reasonably argue that this fundamental problem afflicts almost every rapprochement between evolutionary theory and the Christian faith, including forms that are not as radical as Enns’s. This is the sort of booklet that is best read either when your mind is already well engaged in the topic or when you have a quiet spot and an open Bible so that you can read the numerous passages he alludes to, and gain the full benefits from his arguments. It is not an entry-level account. Not that the writing is unclear; rather, the arguments are fairly tight and the requisite prior knowledge fairly significant. But no one can miss the point that when the apostle speaks of Christ as the “second” Adam, he must be no less real that the “first” Adam (10–11). Anyone who wants to play loose with Adam as a real historical being and try to hold onto Scripture can’t do it, and Gaffin convincingly shows why. 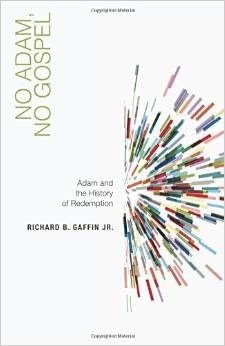 Review of Richard B. Gaffin, Jr., No Adam, No Gospel: Adam the History of Redemption (Phillipsburg, NJ: Presbyterian & Reformed, 2015), 29 pp., $4.99.